The Republic of Equatorial Guinea is located in Western Africa, bordering the Bight of Biafra, between Cameroon and Gabon. 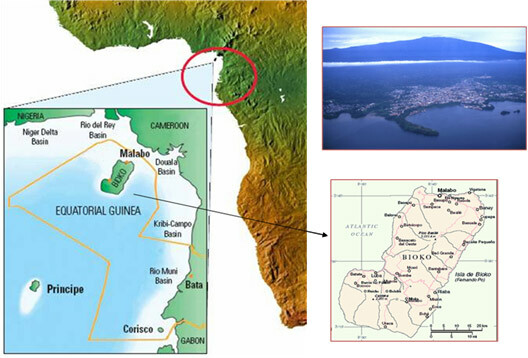 It is one of the smallest countries in continental Africa, and comprised of two main regions: a Continental Region (Río Muni) and an Insular Region (Bioko and Annobon), where the capital Malabo is situated. Included in Rio Muni are the small islands of Corisco, Elobey Grande, Elobey Chico, Mbañe, Cocoteros and the numerous small islets in Corisco Bay. The climate of both the continental region and the islands is typically equatorial, with high temperatures, heavy rainfall, and cloud cover most of the year. Local variations are due to differences in altitude and proximity to the sea.